As a new resident of Brodheadsville in 1989, I noticed the ruins of a building while driving on Silver Valley Road, about a quarter mile off Rt. 209. Opposite these ruins was an old barn just about ready to collapse. I didn’t pay much attention to it then, but after a time I decided to go and have a look at the ruins to try and determine what they once were. I took a number of photographs as I explored the ruins. From what remains were left, several wood cogged and metal gears, I determined that it was once some type of Mill, either for grain or woodworking. Several years later while researching the land I presently own and the development called "Stamford Heights", I came across a number of references to the "Red Mill", and another called "Wagner’s Mill". Both were located on McMichaels Creek in Brodheadsville, being only several hundred yards apart in distance. After extensive research I came to learn that Wagner’s Mill, and the Red Mill were a gristmill's for corn or wheat milling. One of the most important records pertaining to these mills was a land lease agreement by the founder of the Pohoqualine Fish Association. John Price Wetherill leased the water rights of McMichaels Creeks from the local farmers and mill owners so as members of his fish club would have unrestricted access to the creek. The original lease period was for ten years. It was these land lease records that helped establish the locations of the mills, and the locations of the various properties. The Red Mill still exists but only as ruined walls, and some remaining machinery. In the past 15 years much of this has deteriorated to the point of barely being recognizable. Fortunately I have the original photographs taken when I first explored the mill, and later photos as I became more interested in its history. At one point I decided to take measurements of all the existing machinery and ruins still intact, and using a CAD program, to construct a three dimensional model of the mill based on the information provided by the ruins. Mrs. Virginia Frehoffer, who had lived in a house across the road from the mill told me what she could recall of the mill and its operation. Mrs. Frehoffer had lived in the immediate vicinity of the mill all her life, having been born in a house only a few hundred feet from the mill site. On that property was an old barn, directly opposite the mill. The barn was torn down in the late 1990’s. Photos of this barn are included in the photo section. Years later, after her marriage, she and her husband purchased and moved into the house directly across the road from the mill site. Her new home was almost in the rear yard of the house in which she was born! When I met her she was 82 years old if I recall her age properly. I asked her if she would be so kind as to draw me a picture of how the mill once looked, or if she would look through her old photos to see if she had any photos of the mill. Several months passed, then I received a call from Mrs. Frehoffer telling me she had found some items I might be interested in. I was very pleasantly surprised by her showing me a number of old "Polaroid" photographs which her husband had taken in 1959. During the dismantling of the mill in 1959, and subsequent sale of the lumber and mill machinery to a renovation firm, her husband had taken photos showing various stages of demolition. She claimed the mill lumber and machinery was used in either a home or restaurant constructed of the old mill lumber. It has been a popular trend to use old barn siding and framework in the construction of new restaurants or home den additions. She claimed most of the lumber and other items from the mill was all reused, but she could not recall the new location. These photographs showed the skeletal structure of the building, its framework, and what the long gone exterior of the mill once looked like. These photos were vital to the construction of the 3D engineering model I was creating. I now knew the inner structure of the building, its window arrangement, height, and outward appearance. Before these photos, I only had the stone remains of its foundation as a guide. From these photos, and talking with Mrs. Frehoffer, I was able to construct a fairly accurate model of the building. While trying to find the source of power for the mill, the water wheel, I came to find that a water turbine powered this mill instead. In the water wheel pit I discovered the top surface of a 24" diameter iron casing. Research revealed it to be a water turbine. The turbine is still in site, but completely buried in the creek bed mud. It is beyond my resources or authority to excavate this piece of machinery but it is being preserved by the mud and perhaps someday may be extracted. Subsequent investigation into the type of water wheel and manufacturer, leads me to believe it may be a Leffel water turbine built by that company here in Pennsylvania. Its design and manufacturer has not been absolutely determined. Later investigation into a mill further downstream which is also in ruins, showed that it too had two similar turbines also buried in the mud. At the Pohoqualine Fish Club offices on Rt. 715 and Hypsie Gap Road, there is also another similar turbine intact in the pump house located behind the main building. This turbine was used to drive a dynamo to create direct current electrical power for the Fish Club’s main buildings. Later on as commercial power became available in this area the turbine was disconnected from the dynamo, and the turbine remains in the pit under the small pump house, water still flowing through its jammed blades. As the years pass, the Red Mill will eventually fall into total ruin with no trace left of what once was. This was my incentive to recreate and retell the history of these mills. They were once a vital part of this community’s evolution and commercial stature. Now they are in ruins, grown over with trees and brush, fast fading into the landscape. This information is presented with the hope of allowing future generations to be made aware of a facet of life here in the West End that no longer exists, the business of milling and the life of the local millwrights. Millwrights were specialist in their day, artists of the grinding wheels, and art of keeping an entire building running as a piece of machinery. Most likely the "Red Mill" was once painted red, but the only color obvious within the ruins is a bright yellow found on many of the stones used in the foundation’s interior. What Wagner’s mill, located further north up the creek from the Red Mill, looked like is unknown, unless someday in the future photos of it will be revealed and complete the story. This photo shows Rt.715 on the right edge of view, and the original old road on the left, running along the base of the hill on which Stamford Heights is situated. In the center area are the remains of old apple trees; there was once an orchard here. This was all originally part of the Mary Carr tract purchase in 1794. In the 1860’s part of the property in the distant foreground became known as the "mill lot" The old road on the left was part of an agreement between Jacob Huffsmith and Lewis Decker made in 1850, which was the basis for the beginning of the construction of a mill on this property. See Misc. B-472 below. Jacob Huffsmith (also spelled Hoofsmith) purchased large tracts of land in this area in the early 1800, after the original Carr tract had been subdivided by George Levers, who had purchased it from Carr in 1812. In 1814 Levers sold this land to Frederick and John Siglin. 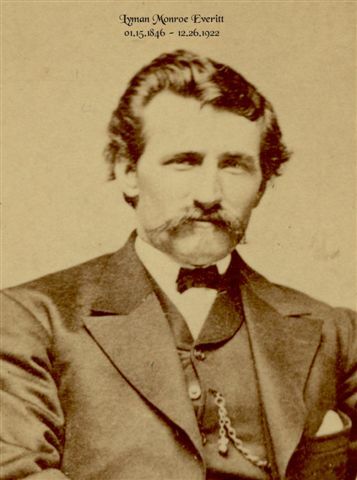 Jacob Huffsmith then purchases 291 acres at a Sheriff Sale after Frederick Siglin defaulted on a debt of $100.71. Jacob Huffsmith died in 1864. 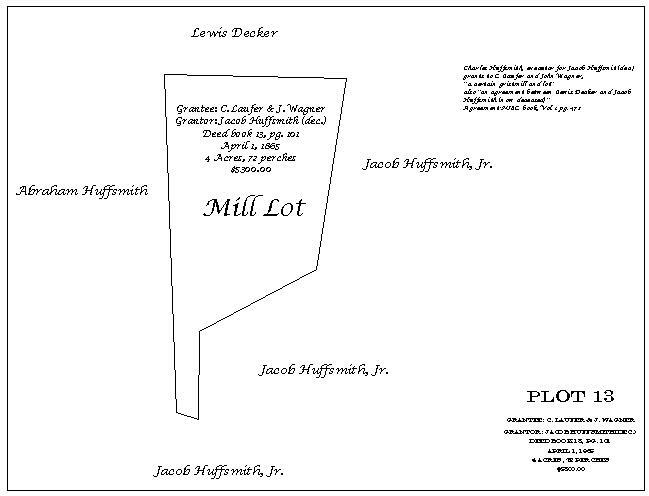 In 1865 Jacob Huffsmith jr. sells the mill and property to Charles Laufer and John Wagner. Abraham Huffsmith, Jacob’s son, obtained the land on the left of the mill lot by will of his father. This AGREEMENT between Jacob Huffsmith, and Lewis Decker, dated Feb. 27, 1850, allows for Huffsmith to build a dam on Decker’s property, and for Decker (who was a carpenter) to build a "shop" with a turning lath and saw on Huffsmith’s property. A millrace ran from the dam to the mill proper then discharged back into the creek. Decker granted waterpower privileges to Huffsmith, and the right for Huffsmith to construct a dam 5’2" in height. Huffsmith grants Decker the right to build a mill on his property and to use the waterpower granted to Huffsmith to drive it. This agreement also allowed Decker the use of the road "now leading to the house of Lewis Decker". (See photo 1) Note: Witnesses are C.D. Brodhead and Rubin Weiss. Justice of the Peace is Felix Storm. The original dam is long gone but this is the dam site, mentioned in the agreement of 1850. This site is on the west side of Rt. 715 about 250’ north of the junction of Cottontail Lane and Rt. 715. This land in the foreground was owned by Lewis Decker, then later in 1868 by Henry Siglin. This is the view of the Dam site from Rt. 715 embankment. This view looks south down McMichaels Creek from the dam site. The millrace ran along the stone line at the left of this photo, to the mill. Rt. 715 runs along the top left of this photo. The original mill, constructed by Lewis Decker on Jacob Huffsmith’s property, was situated just about where Cottontail Lane (on left) meets Rt. 715. This view is looking south down Rt. 715 from near the dam site, towards the mill site. The race ran along the right edge of this photo. The construction of Rt. 715 in 1939 totally changed the topography of this site, completely filling in the race, and destroying the original bridge that spanned the creek on the right edge of this photo. This map shows the location of the original old road (See photo 1), which provided access to the Huffsmith and Decker properties and the bridge across the creek. Also shown are the original bridge over McMichaels Creek, the approximate location of Wagner’s mill, and the present bridge and centerline of Rt. 715. The excavation and grading of Rt. 715 completely changed topography of the location. The road marked "twp. Road" near the word "Miss" is about where Cottontail lane is now located. Where the old road joins Rt. 715 on this plot is the location of Photo 1 above. The area shown in this plot is presently a part "Stamford Heights Farm". This map was made in 1894 to show and describe the properties along McMichaels Creek. The creek bed and 3’ on either side of the creek, which flowed through these properties, was to be leased for the use of the Pohoqualine Fish Club. The leaseholder was John Price Wetherill. In the lease agreement both George Wagner, and Newton Geisinger, were listed as "Millers, whereas the other landholders were described as farmers. Wagner’s mill was originally constructed by Lewis Decker who lived in the house described on this map as "Siglins House". Decker purchased the property (72 acres) in 1848. Henry Siglin purchased this land from the estate of Lewis Decker in 1868. Note the location of Effort Road, now Effort-Neola Road for reference. Part of 1894 Creek rights lease agreement, for Fishing Club. This document between Samuel Reese Gearhart et al., and John Price Wetherill lists George Wagner, who owned Wagner’s Mill, and Newton Geisinger, who owned the "Red Mill" as Millers by profession. All others named were listed as "farmers". This lease was for 10 years duration. This map, a continuation of Map 1 shows the properties south of Wagner’s Mill. The original old road appears as dotted lines in the upper left corner. It also shows the exact location of Wagner’s Mill. Near the bottom edge, or southern edge of this map, appears another mill dam. Geisinger constructed this dam, on Silas Smith’s property. This milldam and pond was the power source for the "Red Mill", which was owned by Geisinger and located about 800 feet south of the dam. Note on the boundary of Siglin and Bond/Wagner is the site of Wagner’s dam and pond. It also shows the arrangements of the then existing roads and the old bridge across the creek on the Bond property. Jacob Huffsmith Sr. previously owned the Bond/Wagner properties. The Bond property is presently the "Stamford Heights Farm" property and was part of the Mill lot in earlier times. Site where millrace joined with Geisinger’s Dam. This photo shows the site where the millrace connected to Geisinger’s Dam. Though barely visible in photo, there is a depression running along center of photo. Much of the race has been filled in by erosion. This photo shows the race as a depression in the ground running along the base of the hill, which is on the right edge of the photo. This view is southeasterly, looking towards Silver Valley Road, from just above the mill site. This photo shows where the race entered the rear of the Red Mill. 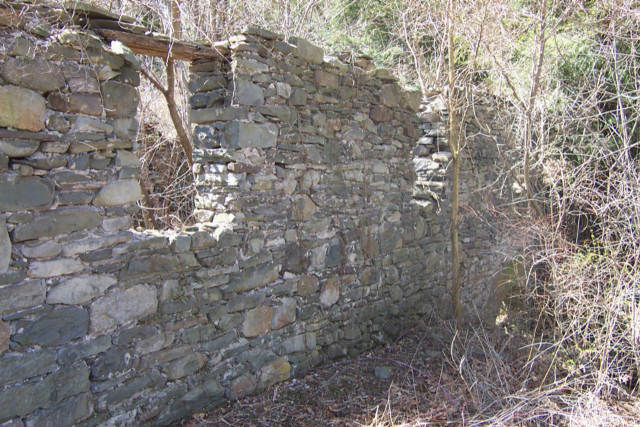 The rear wall of the mill has collapsed, but this photo shows the depression of the millrace and some of the remains of the rear wall of the mill. Photo 1993. This is how the mill looked in 1993. At this time there were still some details left on the building, like the left front door frame and a few upper window headers. This doorframe, present in 1993, was destroyed or taken a few years later. Traces of red paint help confirm the name "Red Mill"
Detail of structure and top drive gear. Note wooden cogs in iron gear frame and 6X6 timber remains. This view shows the opposite side of top gear from photo above. Here you can see it meshing with another drive gear. This photo shows details of hand carved cogs in top gear. Here, most of the frame structure of the "tub" which supported the turbine was still intact in 1993. This is the main drive shaft coming directly out of the turbine housing and the first drive gear on the shaft. The coupling on the left is connected to the shaft, which drives the top gear shown in photos above. Grease box journal on main drive shaft. This opening was kept packed with grease and once had a door covering the opening. This journal was the main vertical support for the drive shaft as it came from the turbine below. View in pit looking towards north wall’s tailrace exit in background. View of tailrace as it exits mill on the north wall. In this view I have cleared most of the debris covering the top of the turbine housing. This view is looking through the remains of the tub structure and shows the turbine buried in the mud. This illustration shows how the turbine would have been mounted in the tub or flume box. This turbine is similar, but not the same type as that used in the Red Mill. The construction principal of the flume box or tub was the same. In this view we can see the profile of the very top of the turbine and the centering device used to center the drive shaft to the turbine shaft. Here we can see two of the intake ports, which were along the outside edge of turbine casing. The shaft on the left is the main drive shaft. Note the adjustable centering device, which had four screws for aligning the shafts. Directly above this device is the first union, coupling the shaft from the turbine body to the geared 2" drive shaft above it. The shaft on the right is the control shaft which controlled the amount of water flowing into the turbine and hence its speed of rotation. This view shows the main drive shaft. From bottom up: centering device, 1st union coupling, floor plates, 1st journal (grease cup type), 1st driver gear, and 2nd coupling. This view shows how the foundation sill was joined with a diagonal cut. This sill is on the top of the south wall. 1993. This view shows the south wall after the upper structure was dismantled in 1959. Note the condition of the sill wood compared to above. Also note, just left of center of photo in top third, is the TOP GEAR, protruding above the foundation and sill. Here is the same south wall window as above, but from the inside of Mill. Note the box like structure on the second floor in this blurred photo. This most likely was the "bolter", a device which sifted the flour into different degrees of fineness. This view shows the barely discernable foundation for the Hurst Frame that was on the interior side of the north wall, along right edge of photo. The Hurst frame held the milling machinery on its own separate foundation, protecting the mill from being shaken apart by the vibrations of the turning millstones and machinery. View of north wall shows the condition of the mill prior to demolition. One millstone lies within the foundation of the Hurst Frame, which was located along the north wall. Bottom photo shows remnants of Plaster of Paris on the millstone’s upward facing surface. The upper or "runner" millstones had a surface of plaster of Paris to make a smooth contoured surface to the stone. This evidence seems to indicate this was a "runner" or the upper rotating millstone. This type of wheel usually drove a leather belt, which was used to drive other machinery. Shaft bushing frame construction detail. Note the barely visible original pencil marks on the wooden frame timber on which the shaft bushing is mounted. Each timber was fitted into a notch, as was the base of the bushing. This rotted wooden shaft and metal spindle were found outside the south wall of the mill in 1993. When originally photographed I did not know what this 10’ shaft and axel were used for. It was only identified in 2003 after a visit to the Cavern’s Creek Grist Mill in Howe’s Cave, New York, where I found an exact match of this tool. This photo shows the exact match of the hub end of the above photo. This shaft, with wooden tabs in a helical spiral was used as an auger to push the flour along a trough as it moved through the mill. This view of the north side of the Mill is one of the only two photographs of the complete mill known to exist. This was probably taken in the winter of 1958 or a little earlier. Mrs. Virginia Frehoffer provided all photos of the mill during demolition, and those on this page. Mrs. Frehoffer lived her entire life within 500’ of this mill. She lived directly across the road from the mill after she married. Mr. Frehoffer took these photos using a "Polaroid Land Camera". The mill was demolished in 1959, as this was the date on several of the photographs of the demolition. By 1958, the Mill was in a state of deterioration. All the windows and frames have been knocked out and the roof is deteriorating. The siding is weathered, and the rear wall is still in tact. If the mill had been painted red, there is no sign of red in this photo. All the siding and timber construction, along with the mill machinery, was sold and re-used in home renovations. It remains a popular style to use old weathered wood siding and beams from farmhouses and mills in new home construction or restaurant interiors. This barn was located opposite the Red Mill on the easterly side of the sharp curve Silver Valley Road makes just before the mill site. This barn is similar in construction to the mill and may have been part of the mill operation. This barn has been completely torn down and plowed over. The original cornerstone with owners initials (JS) and date of construction-1861-survives and is located near the side entrance to the house that is on that property. This is the cornerstone from the barn shown above. An 1875 map of this area shows a J. Smith living here. Silas Smith owned the property the milldam used by the Red Mill was located, and the land this barn occupied. This barn may have been constructed by one of his sons (James?) in 1861. Map detail of Red Mill area. This 1894 map, a detail of the Pohoqualine leasing agreement, clearly shows that a Silas Smith owned the property on both sides of what is now Silver Valley road. Silas Smith may be the son of "J Smith" shown below on an earlier 1875 BEERS map. UPDATE: From a letter I received in 2011 from a decendant of the Heller family, it proves that Joseph Heller sold his property AND MILL, to Philip Geisinger. James Heller was the original owner of the RED MILL. Pohoqualine Fish Association turbine site. This small building located behind the main building of the Pohoqualine Fish Association on Rt. 715 in McMichaels houses a water turbine that is very similar to the turbine found in the RED MILL and another mill site on McMichaels Creek. The turbine in this site was once used to drive a dynamo to generate power for the Fish Associations main building before commercial power was available in this area. This turbine is very similar to the turbine located in the RED MILL. It is of similar design and construction. The main shaft and control shaft (located on right but missing) are identical to the Red Mill turbine. This view is through the hole in the floor of the turbine house. A portion of the belt wheel pulley that connected the turbine to the dynamo is visible at top center of photo. This photo shows the main drive shaft of the left, and the control shaft mounting. The control shaft is missing but was used to set the vanes in the turbine to control the speed of the turbine. Mill ruins on McMichaels Creek south of Red Mill in Village of McIlhaney. This ruin is located about 1 mile south of the Red Mill. The name of the mill presently is not identified. It was a larger operation than the Red Mill and contained a water turbine which is still located at the site but buried beneath the mud. Only the coupling on top and centering device below it is visible in this photo of the protruding drive shaft. All of the turbine lies buried below the mud. The couplings and centering device are virtually identical to those used in the Red Mill and must date from the same time period. The barely visible millstone, likely the "bed stone" or bottom stationary stone, lies in the ruins of the mill. Most of this mill has been overgrown with trees and vines. It had two metal flues and two turbines to drive its wheels. This mill remains to be investigated and identified.